Just got back from playing on the seafront…what an experience but it was worth it. 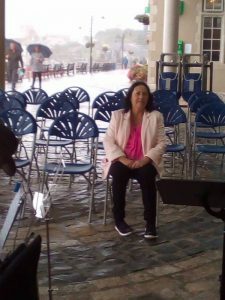 We all got soaked to the skin getting there but once in place we were snuggly seated in the performance area and even managed to attract a small group of hardy music fans, including a lady we often see in our audience who was sitting there as usual calmly knitting! There were only a few of us but we made some noise and we were very pleased to be able to do our bit for Candles on the Cobb. Its rotten luck for the Rotary Club to have such awful weather, particularly after such a glorious summer. It’s worth mentioning that Brian, our MD, and Jo on euphonium travelled over from Weymouth and our Chairman, Paul, who plays bass, drove across from Portland. 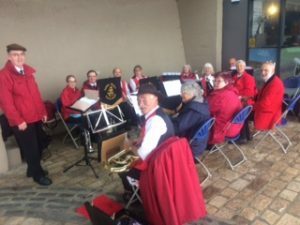 Such is the dedication of Lyme Regis Town Band! 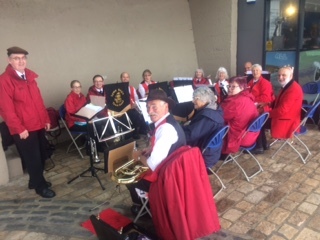 Other pla yers today were John on euphonium, Debbie on Baritone, Adrian on trombone, Viv, Lynne and myself on tenor horn, and Kathy, David, Ellis and Catherine on cornet. Thanks must go to Alan Vian on the PA system who bigged us up at every opportunity! Alan kindly took a photo of us (above). Spare a thought for Ellis’ mum who at one point carried the responsibility of being the only audience member (left). 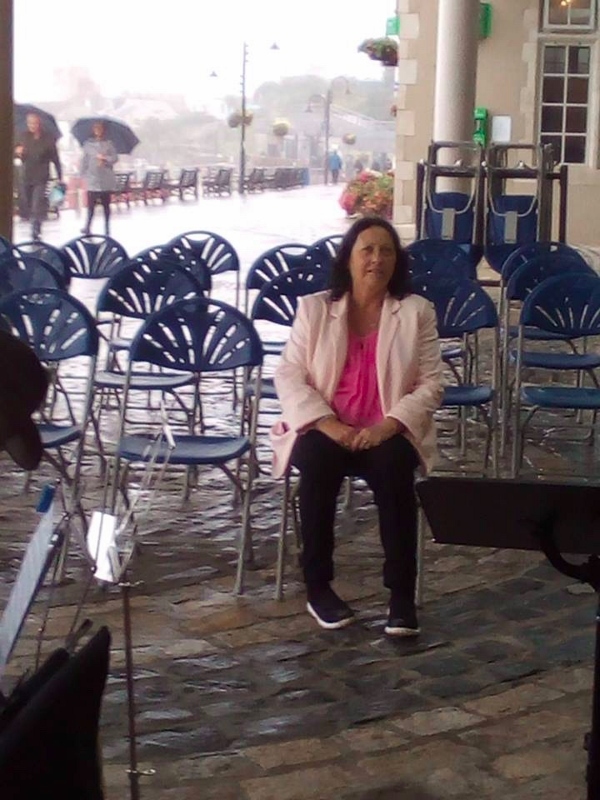 We will be back on Tuesday evening at 8.00 pm for our final concert on the seafront, when we hope the weather will be kinder to us. Come along and join us for Auld Lang Syne.